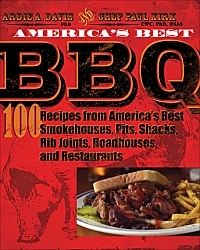 I was really excited last month when I was contacted by the publisher and asked to review America's Best BBQ: 100 Recipes from America's Best Smokehouses, Pits, Shacks, Rib Joints, Roadhouses, and Restaurants. I must say that I'm now really glad to have had the opportunity. This book is written by Ardie Davis and Paul Kirk. Both of these men are barbecue legends, and authors of several books. They have an astonishing knowledge of the craft and it shows throughout the book. That is no doubt why they both have the PhB (doctor of barbecue philosophy) after their name. It's not often that I find a cookbook that is actually fun to read. They are usually very utilitarian, with little literary meat on the bones. This is clearly not the case with America's Best BBQ. I don't know what I enjoyed more, the authentic and varied recipes, or the barbecue stories and lore that they are steeped in. While the book is historical, it also has an incredible variety of recipes. It includes everything from starters like Volcanic Goat Cheese, Rocky Mountain Oysters, and Fried Cheese Stick Grits, to Burgoo, to mutton ribs, and all the barbecue standards in between. The range of recipes is excellent. Even better, most of the recipes are from the originators themselves. I found the following statement from the introduction very interesting. "Each joint in this book is, in our view, one of the best in America. They are all on the same playing field, with varying strengths and weaknesses. That aside, we have each named our Top Ten joints in the back of the book." Barbecue is very competitive and often chock full of ego, as is the restaurant industry generally. It's very refreshing to see the authors give their honest opinions about what they feel are the best. If you love barbecue, its history, and great recipes, I wholeheartedly recommend this book.